Love Wrappers is dedicated to providing love and comfort to babies, children and teens in need in our area through quilts. Guild members produce literally hundreds of these quilts every year. Fabric and batting donations (as well as our July social fundraiser) throughout the year support this project. Quilt kits are available at every meeting for members to pick up and complete at their leisure, to be returned at a subsequent meeting. The basis for these kits are 6-1/2” "picture" blocks. These are muslin squares with cheerful pictures drawn by approximately 7,500 local area 4th graders at Quilt Quest each fall, an art activity held in conjunction with the Red River Revel Arts Festival. The majority of Love Wrappers are made from these squares, alternating a “kid print” with the muslin pictures. However, guild members may certainly use fabric of their own choosing in making a Love Wrapper. Who receives these works from the heart? Local hospitals and care facilities such as the LSU Critical Care / Medical Center, Suttons Childrens Hospital, the Cara Center, Gingerbread House and the Ark-La-Tex Crisis Pregnancy Center. 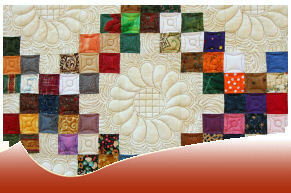 Quilts are also given to other organizations as special needs arise. · Help cut kits. Throughout the year, Cindy coordinates “cutting parties” as needed. Those who join in help cut the muslin squares to be colored as well as fabric & batting which are then assembled into kits. · Make a quilt. Either pick up a kit (which includes pre-cut squares, batting, backing, binding & label) at a Guild meeting or use your own fabric. There is no time limit on turning in quilts – it’s up to you and your time availability. You also don’t have to commit to making an entire quilt. If you’d like to piece a top and leave the quilting to someone else, that’s okay. If you’d like to quilt a completed top (great for practice!) that’s okay too. All efforts are appreciated! · Assist at Quilt Quest. Remember those 7,500 4th graders? They need guidance. Individual classes come through over the course of the week as part of their visit to the Revel. Cindy coordinates volunteers to explain the “draw a happy picture on muslin” idea to the children and help them color their creations with fabric markers. Guild members also demonstrate how blocks are sewn together into quilts for the kids (the boys especially enjoy watching the machines “go”). Doesn’t this sound like fun? For a further explanation of Quilt Quest click here. There is always room for more helping hands on this project! Contact Cindy with any questions.